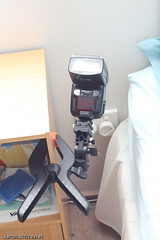 My take on the DIY super/flash clamp. 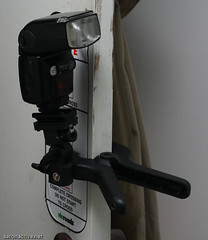 Strobist had posted up this little beauty of an idea for sticking strobes on things with minimal cost. Literally this was like under $3 US. Living in Australia, it’s a little harder to come by cheap bits and pieces.. I don’t think I’ve seen any of those metal clamps for 99c here, also those spigots are over $10 on their own down here. I’m a big fan of DIY. Especially when it comes to anything photography. I decided to see if I could make my own flash clamp. My criteria? Cheap (Under $10… gotta start somewhere) and simple with no special bits to it. Living in Australia, Bunnings is probably the most widely known home hardware store – So that’s where I plan to get my parts from. The spigots that are typically used have either a 1/4 thread (same as what is on the bottom of your camera) or a 3/8 thread (the larger one on the top of most light stands, etc) – I didn’t need to screw anything on to the clamp so I didn’t bother getting these thread sizes. If you want to screw on a compact camera or something to your clamp you may want to consider thread size when you purchase your bolts. 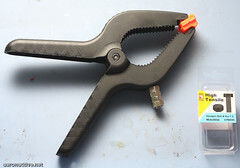 Here’s what I found to make my DIY flash clamp. Total: $8.62 – That’s cheap enough for me. Cheaper still if you just go to a nuts/bolts place and buy them separately. So how does it work? Pretty damn good for under something that took 5 minutes to make for under $10. Something you could do, if you wanted to be totally paranoid about the nuts coming loose over time – Buy some threadlocker. Its in the same isle as the nuts and bolts and its called Loctite. Put a few drops of this on the thread of the bolt and screw the nuts down..They wont move after that. This is just how I did it, feel free to change whatever you want to suit yourself. Let me know if you found this little tip handy though, I’d appreciate it! The umbrella stand I used comes with a silver umbrella and is from from DealExtreme for $15 bucks shipped.